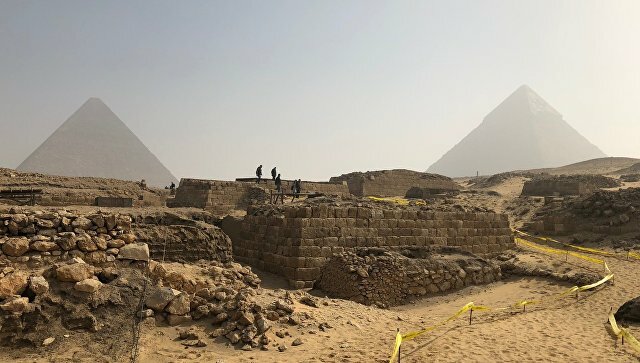 The Czech archaeological mission, working in the vicinity of the Saqqara necropolis near Cairo, discovered a large tomb of the V dynasty of the ancient Egyptian pharaohs (2504 – 2347 BC), Mustafa Vaziri, head of the High Council for Ancient Monuments, told reporters. According to him, the tomb, made of limestone and brick, belonged to a man named Ka Iras, who lived in the middle of the V dynasty during the pharaohs Niferefra and Niuserra. He allegedly served as Pharaoh’s Charge d’Affaires, as evidenced by the engraved graffiti. Archaeologists also found in the main shaft of the tomb a split monument of pink granite, which depicts the “owner” of the burial. Scientists will continue to dig in the discovered tomb. In the archaeological complex Saqqara in the vicinity of the Egyptian capital is the oldest necropolis, the first burial of which belong to the I dynasty of the pharaohs (XXXI – XXIX centuries BC). One of the most famous monuments of Saqqara is considered the step pyramid of Djoser.